Connecticut, come upon an Eastern Box Turtle. This beautiful creature, whose scientific name is Terrrapene carolina carolina, has black designs on a background of orange, yellow, or tan. It is colorful yet surprisingly inconspicuous on a leafy forest floor or among meadow grasses. Common less than half a century ago, Eastern box turtles are now listed by the State Dept. of Environmental Protection as a Species of Special Concern. They have disappeared from many areas where they once thrived, as suitable meadow and deciduous forested habitat has dwindled and become fragmented. These are potentially very long-lived turtles (sometimes over 100 years.) However, population trends have been steadily downward since the advent of cars and suburban sprawl. In the 21st century there are more hazards (e.g. traffic, lawnmowers), so that adults die sooner, on average, and lay fewer nests of eggs in their life time. Fewer eggs hatch because ironically the abundance of nest/egg predators such as skunks and raccoons is higher in suburbia relative to rural American and forestland. A small, isolated Eastern box turtle population can, sometimes, hang on in a three to five-acre isolated woodlot. One such woodlot was found in Meriden recently, and preserved using CT DEP open space acquisition funds. But over the long term, genetic problems from inbreeding are likely in an isolated woodlot, unless a few new individuals can be introduced. However, captive breeding is something currently not allowed by the CTDEP Wildlife Division; this seems wise as a carefully designed program is needed to make sure existing populations are not depleted. I have also read that sometimes introductions can actually cause genetic problems to a long-coevolved inbred population, though the examples were in the plant kingdom. The chances of spotting a box turtle will be highest in the next few months. In the set of records I submitted last fall to CT DEP most observation dates were in May and June or early July, with one outlier in early April. These are the months when female turtles of several species venture out of their small, familiar home range and travel to a suitable sunny nesting site with soft, friable soil. Males also often leave home at this time of year, searching energetically for a mate. (They have ardent red eyes and concave undershells, for better purchase on the back of a female, with brown eyes and flat undershells.) 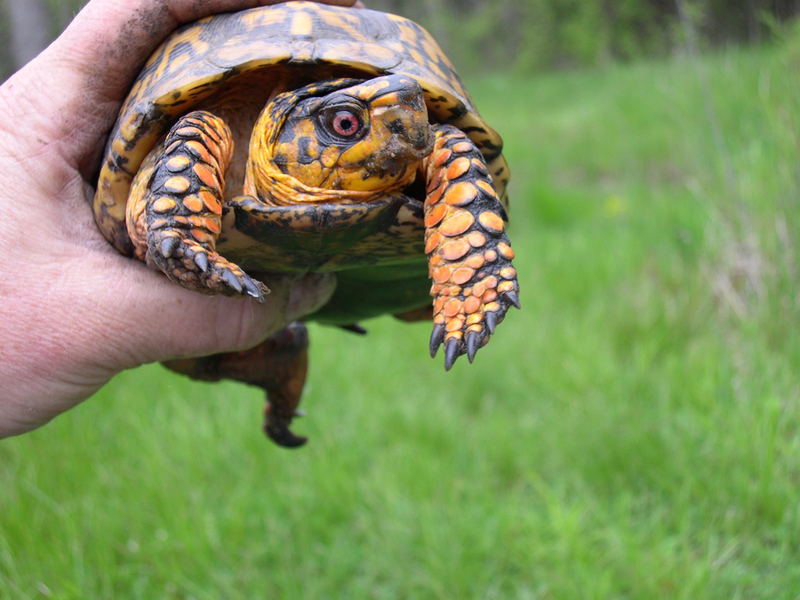 Most box turtles can be picked up easily and safely, but a male in spring could scratch. Don’t pick up snapping turtles (dull, blackish, compared to box turtles, as you can see from on-line photos); their bite is dangerous. Most turtle travel takes place on the day after a rain. Eastern box turtles prefer pleasant cool weather for hiking and foraging because they are very sensitive to dehydration. Physiologically they are more like aquatic turtles, than terrestrial tortoises. That’s why they like to move about in the dewy morning, soak themselves in pools and puddles on hot days, and are so often found in lush, moist microhabitats. Favorite foods are all juicy: strawberries, mushrooms, slugs, and jewelweed. Dr. Michael Klemens, a well-known herpetologist, has New York State data showing that a preferred hibernation site is deep, moist, organic rich soils on wetland edges. Especially during spring travel, they risk road kill, mower injury, poisoning by lawn pesticides, and kidnapping by well-meaning persons. If they do manage to lay eggs, more often than not the nest will be predated. A friend of mine, Tony Ianello, invented an ingenious wire cloth nest protector, with miniature exit doors for the hatchling turtles, when working for the Quinnipiac Watershed Association (QRWA), as coordinator of the Turtle Crossing Program, funded by the National Wildlife Foundation. Unfortunately the red tape hurdles precluded its use on this state listed species., or on wood turtle, also a Species of Special Concern. Note that photo captions do not provide exact locations; this is per CTDEP guidance to prevent collection for the pet trade, or laboratory animal trade- there is still a market, though less than in the past, and less than down south, where they are more common. This entry was posted in Wildlife Habitat and tagged eastern box turlte, habitat fragmentation, inbreeding, nest predation, poisonous mushrooms, roadkill, turtle, wildlife travel corridors. Bookmark the permalink. Juicy slugs. I prefer the sounds of strawberries. thank you for the wonderful facts about this turtle. my friends and I found one outside and these facts were perfect for us thanks dude.